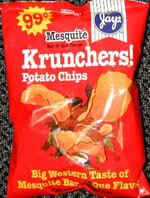 Taste test: Good crunch, with a lot of powder on the chip (some did get on my hands) and a sweet barbecue taste. There's also a very slight taste of charcoal, kind of like the taste you get when you've burned your barbecued chicken on the grill. Smell test: Slight barbecue smell. This snack was discovered by Marlo in Chicago.